Modell's Sporting Goods sells equipment for every sport, outdoor gear, exercise machines, apparel, and footwear and a variety of sports collectibles. 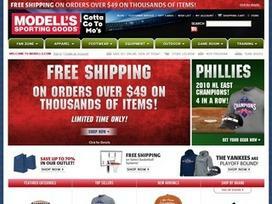 Modell's Sporting Goods opened its very first store in 1889. From their original location in lower Manhattan, the retail sporting goods and apparel store has grown and expanded to 150 locations along the nation's East Coast. Locations stretch from New Hampshire to the north down to Virginia toward the south. Athletic and casual apparel account for a large share of the company's overall business. Major national brands like Jockey, Jensen, IZOD, and Russell Athletic are featured along with hundreds of other well-known clothing and apparel manufacturers. There is a wide selection of athletic and casual clothing for men, women and children. Athletic clothing includes authentic jerseys for all of the major sports, Lycra cycling shorts, loose-fitting tennis shirts and much more. Clothes, specific to women include sports bras, bodysuits and cheerleading outfits. Popular and practical casual wear ranges from fleece coats and insulated ski jackets to compression tops and loose fitting Polo shirts. Modell's Sporting Goods also has a very large selection of footwear. They feature familiar brands such as Nike and Adidas and carry both casual and athletic shoes. Among the wide variety of footwear are hiking boots, cleats, boat shoes, golf shoes, and all of the latest styles in sneakers and running shoes. Probably the category most associated with this store is sports equipment. There is equipment for just about every sport played in America. Whether it is tennis racquets, ping-pong paddles, baseball bats or basketballs, you can find a number of excellent brands in each category. Golfers can select clubs from a host of manufacturers and get their Titleist, Pinnacle or other favorite brand of golf balls. Fans of the NFL and college football can find a large selection of team- and individual player-branded apparel. All of the major sports including Major League Baseball, the NBA and the NHL are well-represented. One can find everything from T-shirts featuring the reigning Super Bowl champions to football jerseys of the most popular football players. Customers can sometimes have a difficult time choosing the right equipment for their needs. The well-trained staff at Modell's Sporting Goods is always available to provide advice and give you some help with your purchase decision. The outdoorsman is not forgotten. Among the many offerings are camping and ski equipment, ice skates, fishing poles, scuba gear, and inflatable rafts. If one enjoys outdoor activities, this store has just about everything you might need to hike, bike, swim, sail, ski, or play a competitive game of beach volleyball. Home exercise equipment has always been a popular purchase with the general public. Modell's Sporting Goods offers the latest in technology and design. Bowflex machines are best sellers as are their line of treadmills, stair steppers and other exercise equipment. The store also has a complete line of free weights for the more traditional minded customers who prefer to exercise with dumbbells and barbells. With so many items packed into this sporting goods store, it is impossible to mention them all. A few additional things one can buy at Modell's Sporting Goods are billiard tables, aboveground swimming pools, basketball goals, heart monitors, and sports art. Share what you think about Modell's, and your favorite ways to save there! Modells is awesome! Great store and great prices! !